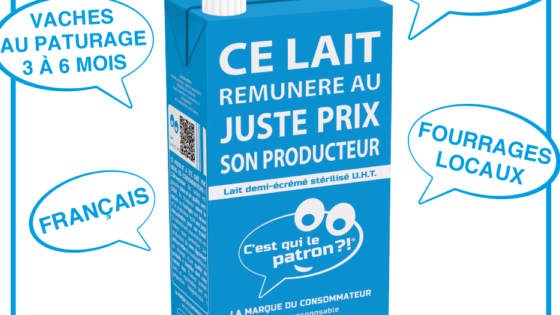 A scheme that pays farmers a fair price for French milk has sold 23m litres since launching a year ago today, and has added pizza, apple juice and butter to its product list, with plans for more. The milk, which is branded “C’est qui le patron?” (Who’s the boss?) under the collective “La Marque du Consommateur” has been available in major supermarkets including Carrefour, Intermarché and Casino for the past 12 months. Launched exactly one year ago, the scheme is a collaboration between milk activists, small milk producers in the Bresse area of France, and the Carrefour supermarket chain. It pays farmers a fair price for their product, meaning consumers pay just 8 centimes more per litre than regular milk. This adds up to the farmers and producers being paid up to €390 for 1,000 litres, compared to the €200 or less per 1,000 litres they would have received before. This is said to have made the difference between some farms staying in business or going bankrupt, according to the activists. Before this scheme, the founders claim, two farmers in France per day were going out of business due to too-low milk prices. There are now 9,000 “partner points of sale” - places you can buy the milk from - and the operation has expanded into apple juice, organic butter and pizza, all of which have been created by small producers, using fully-traceable products - including, for the pizza, high-quality tomatoes and cheese. There are now plans to expand the product list to 20 new items imminently, including yoghurts, compote, ham, and sardines, all under the same “La Marque du Consommateur” brand. “Consumers do not want their money to feed a system that ruins producers,” added co-founder Nicolas Chabanne, also speaking to BFM.